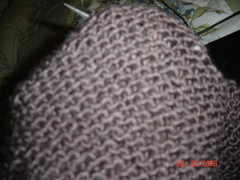 Here it is folks, just the beginnings of my "Tree Trunk Cozy" that I started just a short time ago. I really enjoyed the piece on the "Knitta Gang" from Texas that "knit tags" inanimate objects all over the world. 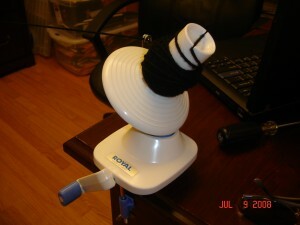 So it was not hard for me to find something to knit late one night in the dark while my hubby was sleeping. I bought lighted knitting needles awhile ago, and only use them when its dark, only problem for me is there size US11, so normally most projects I'm working on are on smaller size needles and of course circulars. The lighted needles are straights, and to me limited in what can be knit. I decided to make the pattern easy, and so it is knit in garter stitch, and I'll be transitioning to a new yarn, possibly a red. The current yarn on the needles is purple, and very pretty. Its scrap yarn, so I don't have any labels as to the specs of the yarn. I plan to get this done within the next week, and will post pics of it keeping my tree cozy. The contest winner for "Can you guess what I'm knitting?" In a earlier post, I recorded myself knitting this in the dark with my lighted needles & asked who could guess what I'm knitting based off of prior blog posts hints. The lucky winner who guessed it, is Leslie! Sock Wars III 2008 "4th Target"
What youâ€™re seeing are my 4th pair of "Detonation" socks for my 4th target in the Sock Wars III 2008 Continues game. I was waiting for a LONG LONG time to get SIPs from my most recent target, but SIPs never came. The new Supreme Commander, Casualknitter, provided help in trying to track down where in the world I'd get my next SIPs to take over. She did some research and I did some research, and we both came to the conclusion that the SIPs were with my last target, but for some reason that person is claiming they never received them, yet if you follow up the shipping chain & tracking #'s, she is supposed to have them. Oh well, for whatever reason, the SIPs are just not coming my way. I don't want to call my last target a poor sport, I'll give her the benefit of doubt; maybe somehow the SIPs went MIA??? Who knows? Anyways, Casualknitter gave me the "green light" to go ahead and start a fresh pair of socks. While most people would love this, I really didn't because that meant that I would have to use sock yarn from my stash or buy new yarn and start a whole new pair from scratch. I would've preferred to get the SIPs, and continue knitting where the previous DEAD knitter left off. This is how the game is supposed to be played, who you kill, stops their knitting immediately & ships the SIPs off to their assassin. $2.00 costs for extra goodies in package (I just have to send goodies with my packages) these include chocolates, tea, etc. $35.00 fee to send Postcard lottery entry to Supreme Commander in the Netherlands, this was to see if I'd get picked as the Sock Wars winner. I know, I know, I must be crazy to have forked out this much, but I'm a pyscho, I like the competitive sport and felt there would be some $$ sacrifice. What I didn't sign-up for was the way the whole game changed, what with the sudden ending and the new "Sock Wars Continues" group, but hey, you can't predict the future, right? After having spent this much, I was kind of thinking of throwing in the towel and bowing out of Sock Wars III. I wouldn't be the first to do this, as many people did once Julie (original Supreme Commander) ended Socks Wars III unexpectedly and early. Believe me, many people were upset. The competitor in me just couldn't let go, so I decided to forge on. What I wouldn't do was use sock yarn from my stash, all my sock yarn is premium quality, and I felt that because I had left so much time fly by, my chances of being killed are really high, thus I didn't want to send any SIPs with premium yarn off to anyone. 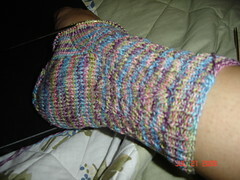 I coughed up the $$ and purchased 1 more skein/ball of Tofutsies yarn, about $20.00, and on I went to start another pair. I know the pattern off memory, literally, so no need for pattern instructions. 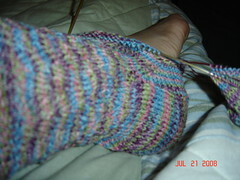 I speeded through the cuff and heel, and for some reason hit a BIG STOP sign after the heel decreases, usually this is the point I get my 2nd wind and zoom to the toe because really, your almost there. But my enthusiasm and desire for this pattern and war has diminished greatly. Especially after encountering the dreaded "SIPs missing in action" debacle. After everything, I finally picked up the needles again, and have started to work at completing these. My goal is to get them done by this weekend to send out first thing next week. There are less than 100 Alive warriors in Sock Wars III right now; the original count was over 1000 warriors, so I am really lucky to still be alive in this war. And, I've been in communication with my assassin, so she's out there, it's just a matter of time for her to kill me, or if I'm every so lucky, for me to go full circle in the chain and kill her (I doubt I'll be that lucky). I've been planning for awhile now, to knit some precious items for a close friend or I should say family member of mines & my husbands. They were expecting their 1st girl after 2 boys, well, time flew and I fell behind on my knitting, what with contests, projects & stuff, anyways, she had her baby girl just a few days after this past 4th of July! We haven't visited the new parents yet, they've probably written us off by now..upset we haven't visited. I had to jump into high gear when I heard she had the baby, so I quickly put down the Socks Wars socks I've been sluggishly working on (yes I'm still alive and starting to get sick of it), and I started knitting these cute Simple Booties & Scratch Mitts as a gift. The pattern is from the book "Easy Baby Knits". 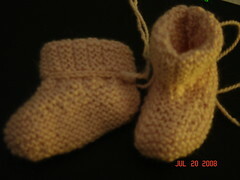 The booties aren't done yet, I still have some ends to weave in and some Pom-poms to make. 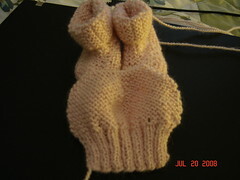 The Mitts are almost done, still have some seaming to do. These little things knit up fast! I'd be done already but I had to visit family this weekend so my knitting got put on hold. I need to go buy some pink ribbon tomorrow so I can put the finishing touches on these cuties. I'll post the final pics soon. So I broke out my handy lighted knitting needles! But I had to think of what to knit with them? Size 11 needles hmm...what project? I figured out what would be the perfect thing to knit, and off I went. I'm about 30% into the project, it's a nice one because it's the easiest pattern, one of my own, and it's already looking very pretty. Can you tell what I'm knitting? Can you guess what I'm knitting? If you guess correctly, I'll give the person who figures it out a gift certificate from The Loopy Ewe. That's all the hints I'm giving, I even think I'm giving to many hints, but we'll see. If nobody guesses, I'll reveal what it is soon. I've been out of work since the beginning of May 2008, a result of a merger with my former company, left my former work headquarters obsolete, thus everyone was out of a job. On one hand it was nice to get a break after 7 years of service, on the other hand, I would've liked to have been able to keep my $$ from my monetary packages I received, but it didn't quite work out that way. I've been actively searching for work, been on many phone interviews, on-site interviews, questionnaires, etc., I've been doing it. Each time coming oh close to landing a job, but never actually panning out in the end. Early last week I got contacted by an agency for a 3 month contract job, with strong possibility for extension and/or permanent status, and was told the job could literally be needed the next day. I was eager and ready, I really hate not having a purpose everyday, although I really forged ahead in the knitting/fiber adventures 8-)...anyways, I got a call the next day from the agency to find out that another agency beat them out, thus I being their candidate was A** out. And I thought I was going to have something to celebrate for 4th of July. This was the Wednesday before the 4th, then late Thursday, Kathleen from the agency calls to tell me everything fell through with the other company, and turns out they'd like to meet me, but since the next day was the 4th, they felt sometime this week would work. So, I had alot to look forward to over this holiday weekend. Plus, the job was almost right in my back yard, Palo Alto, only about 30 minutes from my home. On Monday, I felt that I would sleep in for a bit, until about 9:30 a.m., usually I get right up with my husband and never go back to sleep. So I set my cell phone timer, and in the middle of my dreams, I kept hearing my phone vibrate. I have a Blackberry, so I kept thinking, who's emailing me? I check it out and it's Kathleen to tell me that the company would like to meet me before noon! I rushed, got ready, and was on-site for an interview at 10:30 a.m. sharp. The interview went good, and I was told I would hear something soon. Now, I can tell you, I've been through my share of these types of interviews, I feel there the worst because everything goes good, but yet you never hear anything? So Monday is over, Tuesday comes, and about 9:30 a.m., I get a call, they want to hire me and asked if I could start same day! I'm happy, yet annoyed because I'd like to be prepared. After it all, I made it for my first day of work, noon sharp on Tuesday. Today, was my official first full day of work, and the IT Lead for the site I'm supporting is going on vacation for a week starting Friday, which leaves Lil'O me for a week on my own after only being on board for 2 1/2 days. It's a nice biotech company, and the people are nice too. I'm liking it and only hope that I can handle the job solo while Bob (my co-worker) is out on vacation. With all this going on, my knitting has taken a back seat for the first time in a long time....but I had the best presents waiting for me at home, courtesy of my local Mail Man. 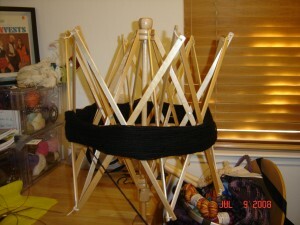 My VillageSpinWeave order for my Large Umbrella Swift & Ball Winder, arrived!!! I love these! So awesome! 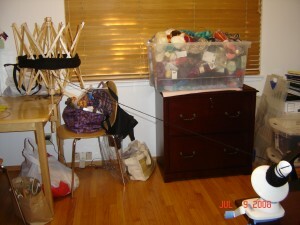 There are many projects that have been deterred because I didn't have a winder to make a yarn cake out of my skeins. I didn't care how hot I was, I set everything up, and picked up the Black Malabrigo skein, destined to be a beanie for my husband, and started winding! I purposely bought the Large Umbrella Swift for my frequent purchases of those large skeins. I took some pics of my new tools, and I know there a good investment for a yarnaholic like me. And I'll listen to Marisol good advice and not get "yarn cake" happy. 8-) I can't say which is prettier, the skein or yarn cake form? What do you prefer?? Why? I'd love to hear?